The phone rings, I pick up, and a dear friend asks if I am coming to the potluck tonight. I say thank you, and I wish I could, but I am terribly swamped tonight and perhaps another time. What I don’t say is, my son is having a bad day, he is on his tenth major meltdown, and I am completely and utterly exhausted. I hang up the phone, sit down on the couch and begin to cry…my feeling of isolation is ramping up again, and a sense of depression and sadness is creeping in around the edges of my life. I don’t fight it, but surrender, knowing that it is not the first or the last time this will happen, me declining invitations from friends, and it has taken its toll on me over the years; my sense of social isolation ever present. Another day, another night, another week and after 18 plus years, I am still struggling to juggle my parenting and work responsibilities, while trying to capture a sliver of free time for myself. As a single parent of a special needs son, I am married to my cell phone. I have every right to believe that the Principal’s office and my son’s caseworker have my number on speed dial. When my phone rings during the day, if I see the prefix 676, I know it is a school district employee wanting to have a word. Reluctantly, I answer the phone hoping that it isn’t bad news, but knowing full well that there has been another incident, Ryan has had an episode at school, and it is my job to calm him so that everyone can get on with their day. As I worry about Ry, my focus as a teacher has flown out the window, and I am left with increased stress, anxiety, and fear about my child’s future. It is my own personal Ground Hog Day, reliving the same experience over and over again. 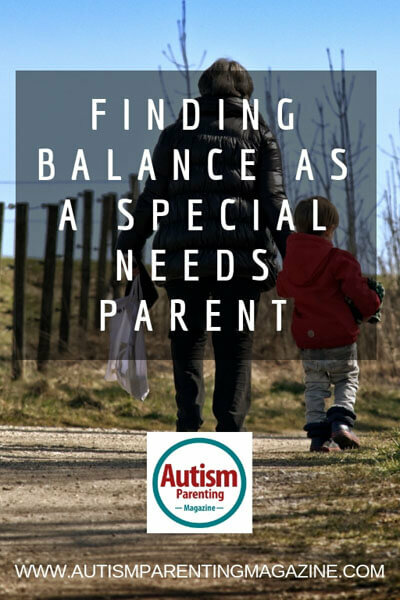 As parents to special needs children, how do we discover a balance between care giving and self-care? There is a fine line between what we can and cannot manage, especially if we feel that we do not have support systems in place. I know that over the years my immune and nervous systems have taken a hit. I am sick with more frequency and developed generalized anxiety by the time Ryan was five years old. It wasn’t the parenting life I imagined for myself when I became pregnant, but it was the one that I was living, and I needed to find a way to manage it better. Recognizing that I am not Super Mom! When I was first navigating Ryan’s diagnosis, his father, Lee, was quite ill with cancer. I was drowning in stress and scrambling to keep my head above water managing Lee’s illness, Ry’s autism, and a full-time job and household. But, ask me how frequently I asked for help? Never, not once…I was my own worst enemy! My “I can do anything” attitude kept me from being vulnerable enough to admit that I needed help, lots of help. I was afraid that I, or more to the point, Ryan, would be misunderstood and I didn’t have the emotional bandwidth for that. Also, I didn’t want to appear weak. In the end, it nearly broke me, caretaking my husband and son, but never providing myself with much-needed self-care. The following year I was sick 16 times…can you imagine, 16? All of us live a 24/7 parenting life, unlike most of our parenting peers, and the best gift we can give ourselves, is to give ourselves a break. I know, easier said than done, but even 15 minutes of quiet can be restorative. Self-love and caring for yourself makes you a better caretaker. Find something simple and meaningful: a soak in the tub; a piece of your absolutely favorite chocolate; play the favorite CD from college…loud! Find the space to have a minute with yourself! It will pay off in the long run. It took me years to slowly cultivate a village around Ryan and me. Like many of you, I did not have the resources to hire caretakers or get kid care if I wanted a night out. But what I did have was a select group of friends who would provide respite when I needed it, whether I knew it or not. These women were my champions. They understood Ry’s special requirements and behavioral issues and would offer me a break every so often. Initially, I would refuse their generosity (Super Mom complex), but over time I came to realize the necessity of having some distance from my son…to just be Kim. It was restorative, necessary, and helped me define myself away from my son, which was very important. So much of our identity becomes intertwined with our child’s disability, and over time we forget ourselves. I find that my internal byline is the widowed mother of a special needs child instead of epic adventuring Super Mom looking for fun around every corner! It is important and imperative that we try to remember our lives before autism so that we can be more present within autism. If you can’t find a community of friends to help, find other parents of special needs children and set up a respite schedule. As Ryan has gotten older, it has become easier to find balance in my life. I can leave him for extended periods of time without worrying too much. It allows me to participate more fully in a well-balanced life that includes activities that I enjoy with friends that care deeply for Ryan and me. It helps me to keep a glass half full attitude and to love the life I live. That’s not to say there aren’t major bumps in the road, there are, but they are easier to manage because I feel less stressed and more capable of finding help when it is needed. And truth be told, I am a better parent when I can find creative methods to reduce my stress. Kimberly Reeves, MEd, is a professor of biology at Whatcom Community College in the Pacific Northwest US. A firm believer in the value and strength of community, Kimberly has served as a board member of Families for Autism Care, Education, and Support (FACES) Northwest, a local summer day camp for children with autism in Whatcom County, Washington, has consulted with her local school district, and assists with her son’s Special Olympics activities. She provides informational support to families processing an autism diagnosis or struggling to understand and navigate their rights and responsibilities as parent advocates and guardians as outlined by the federal government. She and her son Ryan are currently co-authoring a book, Raising Ryan, and are enjoying this experience together. Kimberly welcomes questions or comments.